Which Direction Does The Arrow Go When Installing an Air Filter? Which Direction Does The Arrow on An Air Filter Go? 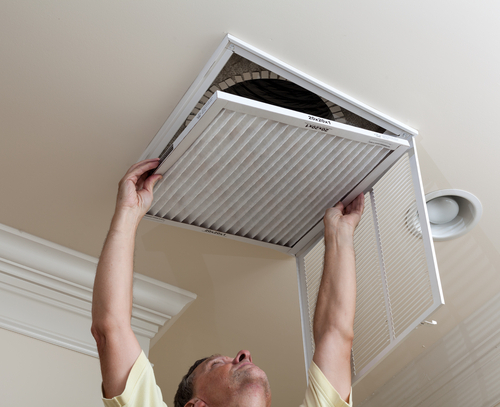 It's a strangely surprising task, changing your home air filters. There’s an arrow on the box, and it says to point in the direction of “Air Flow”, but what does that mean? It means the arrow faces the unit, or in other words, facing inside the space you’re putting it into. Assuming your unit is outside or in your attic, you want the arrow to face the unit. Let’s make this simpler though. Make the arrows face the ceiling or wall. If your filter is on the ceiling, the arrow should face the ceiling. If your filter is on the wall, the arrow should face the wall. Does your filter not have an arrow on it? First check again as nearly all filters do have it, likely in the corner of one of the sides. If it does not have an arrow though, you’ll want the side with the wire-frame to be facing outward. This means the side with the wire-frame will be on the outside, or the side closest to you, and the side without it will be inside closer to the unit. If you’re still having trouble, you can email us a picture of the filter and encasement and we’ll let you know which way it goes. All of QualityAirFilters filters come equipped with the arrow for easy installation.